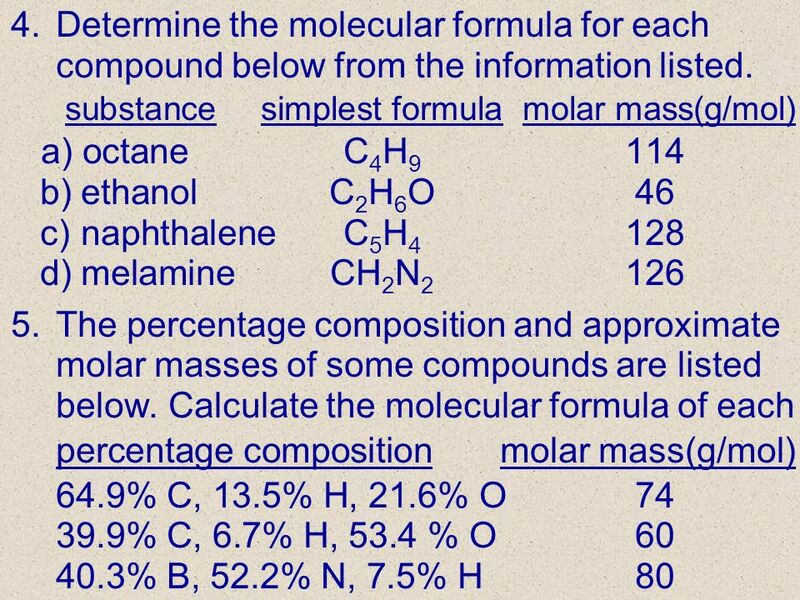 3/27/2017 Simplest formula calculations Q- a compound is found to contain the following % by mass: 69.58% Ba, 6.090% C, 24.32% O. 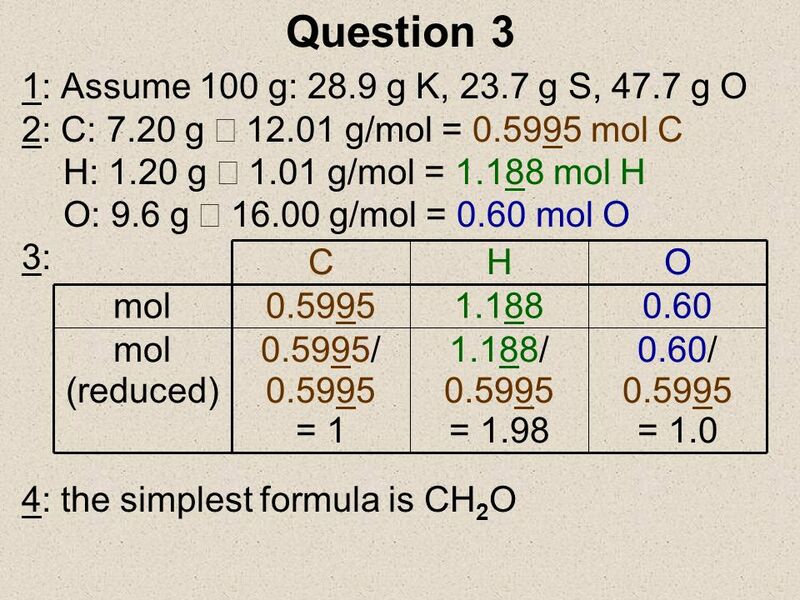 What is the simplest (i.e. 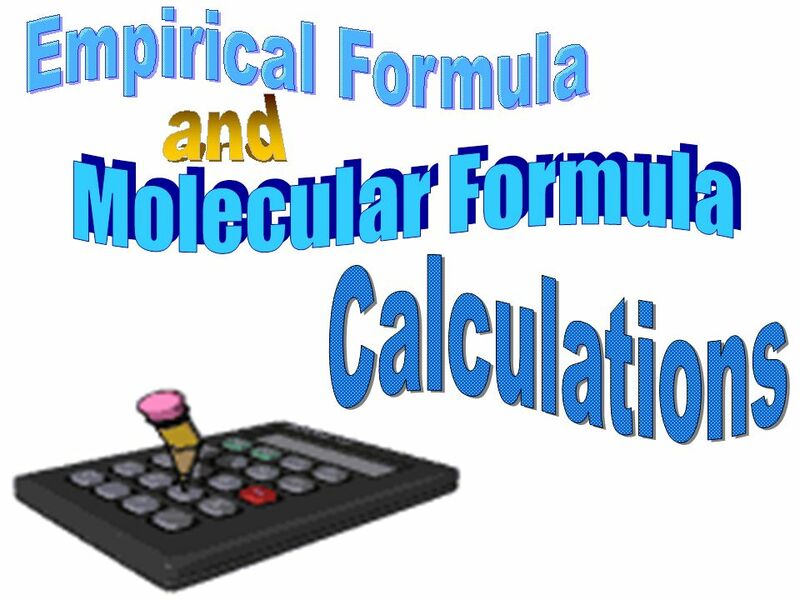 empirical) formula? Step 1: imagine that you have 100 g of the substance. Thus, % will become mass in grams. 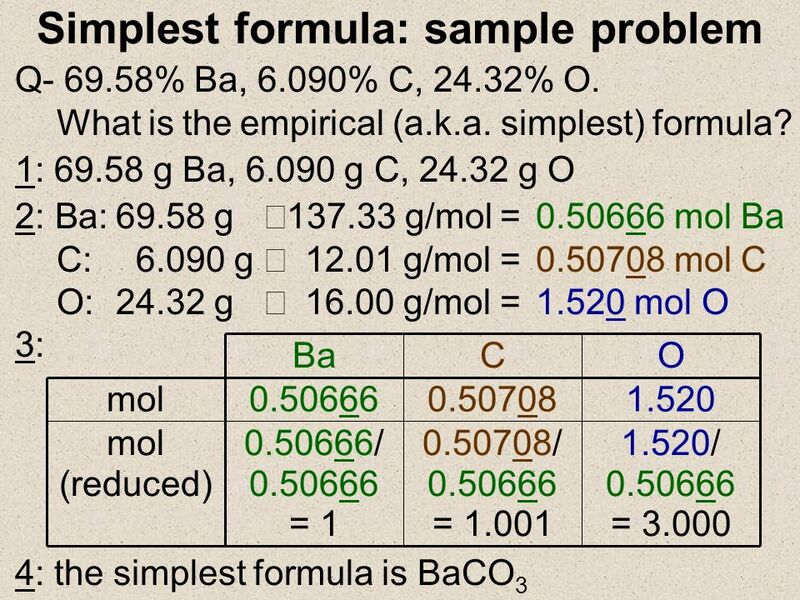 E.g % Ba becomes g Ba. 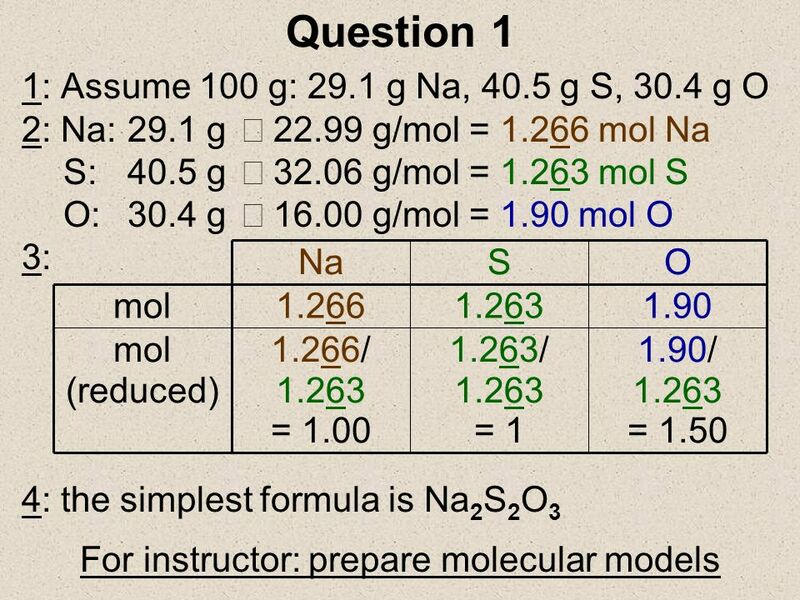 (Some questions will give grams right off, instead of %) Step 2: calculate the # of moles (mol = g ¸ g/mol) Step 3: express moles as the simplest ratio by dividing through by the lowest number. 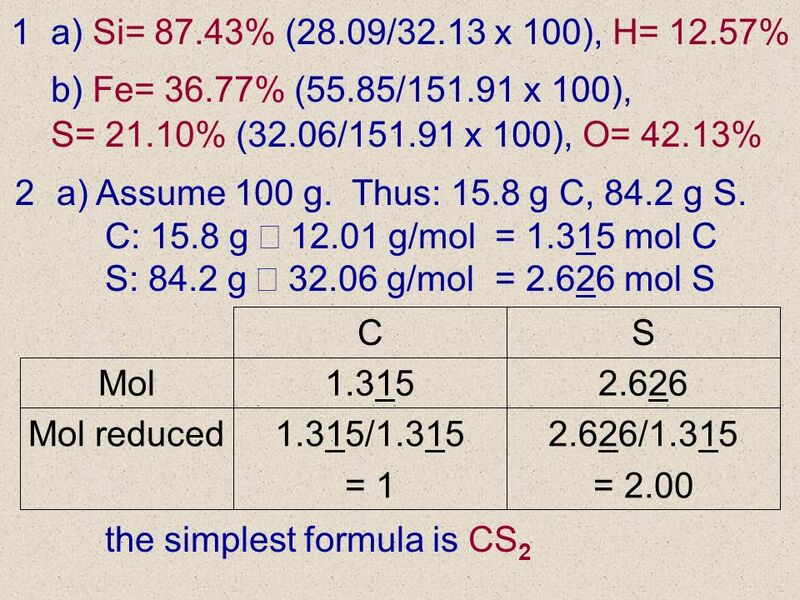 Step 4: write the simplest formula from mol ratios. 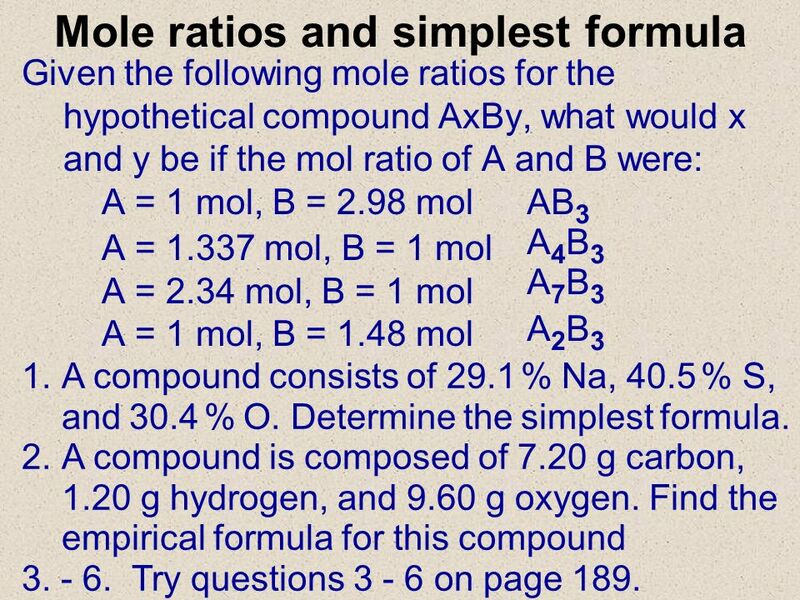 3/27/2017 Given the following mole ratios for the hypothetical compound AxBy, what would x and y be if the mol ratio of A and B were: A = 1 mol, B = 2.98 mol A = mol, B = 1 mol A = 2.34 mol, B = 1 mol A = 1 mol, B = 1.48 mol AB3 A4B3 A7B3 A2B3 A compound consists of 29.1 % Na, 40.5 % S, and 30.4 % O. 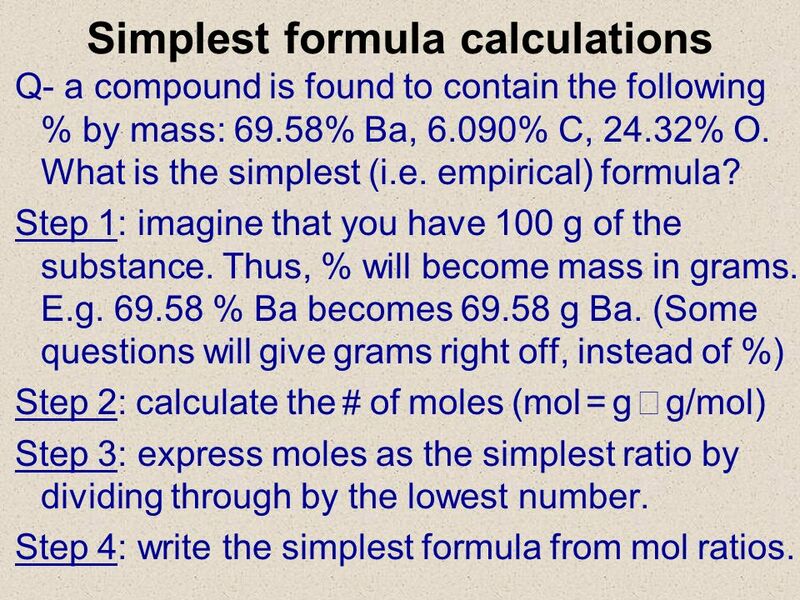 Determine the simplest formula. A compound is composed of 7.20 g carbon, 1.20 g hydrogen, and 9.60 g oxygen. 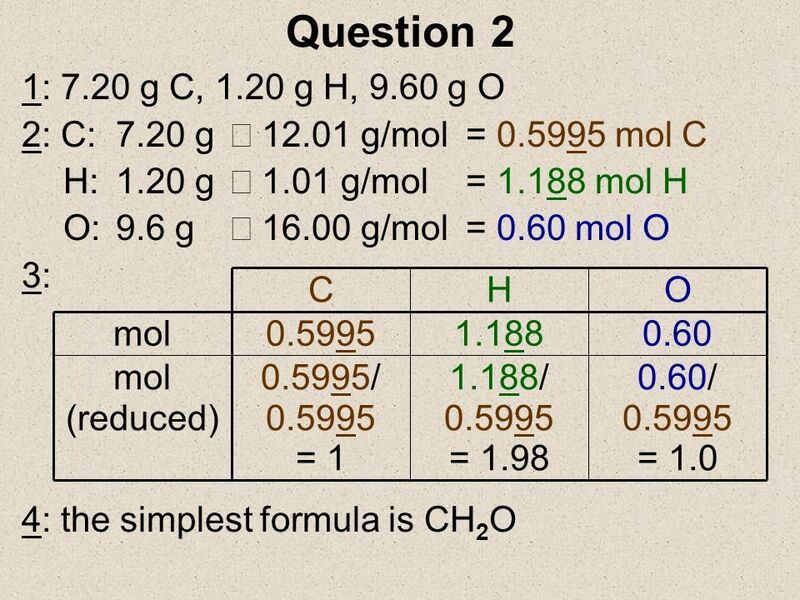 Find the empirical formula for this compound Try questions on page 189. 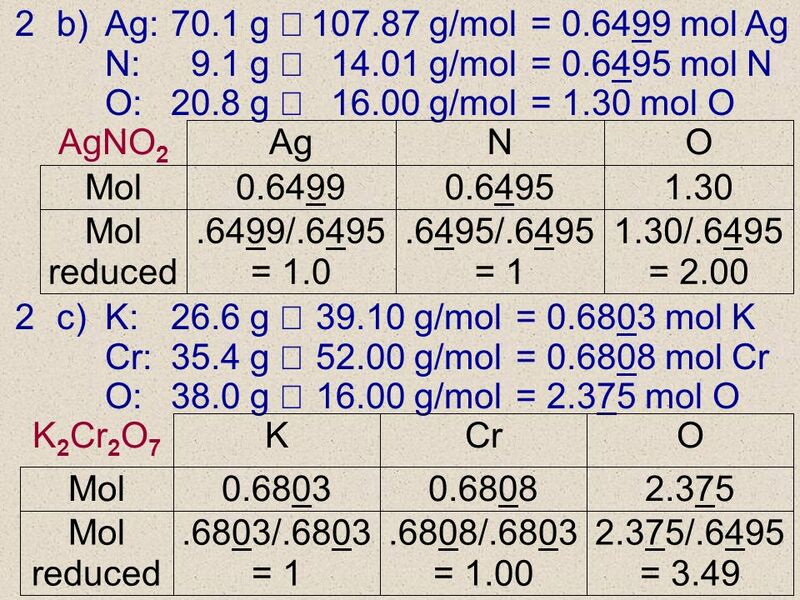 3/27/2017 Combustion analysis gives the following: 26.7% C, 2.2% hydrogen, 71.1% oxygen. 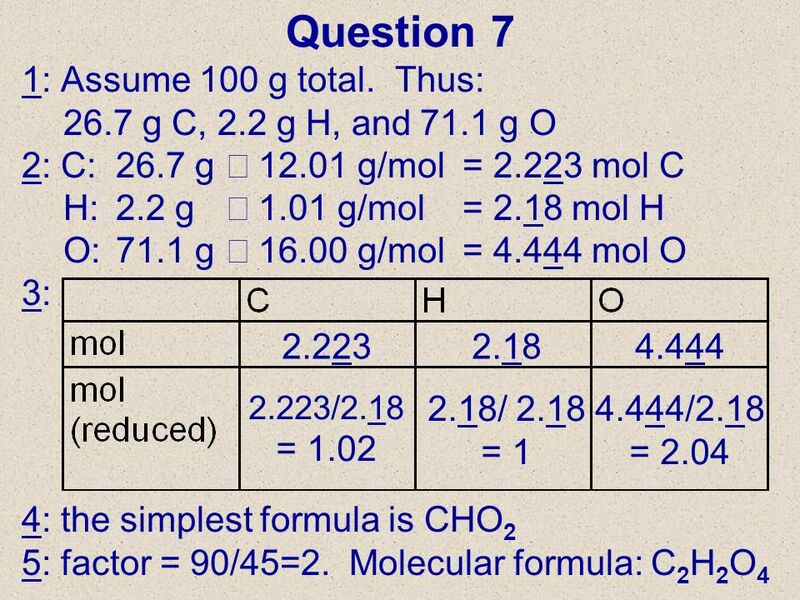 If the molecular mass of the compound is g/mol, determine its molecular formula. 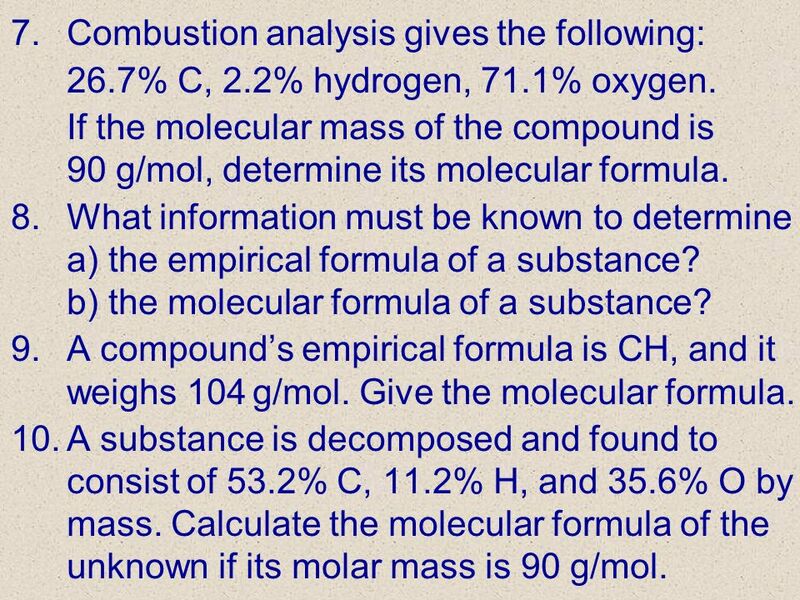 What information must be known to determine a) the empirical formula of a substance? 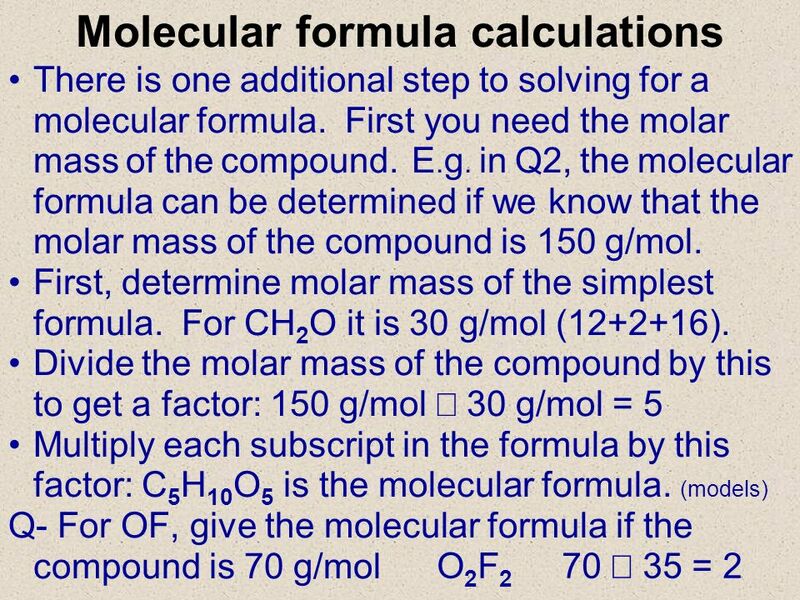 b) the molecular formula of a substance? 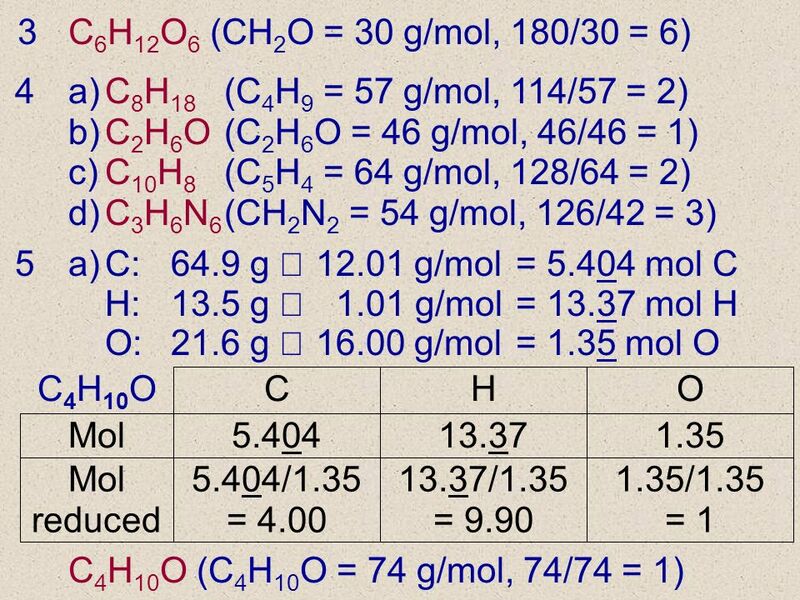 A compound’s empirical formula is CH, and it weighs 104 g/mol. 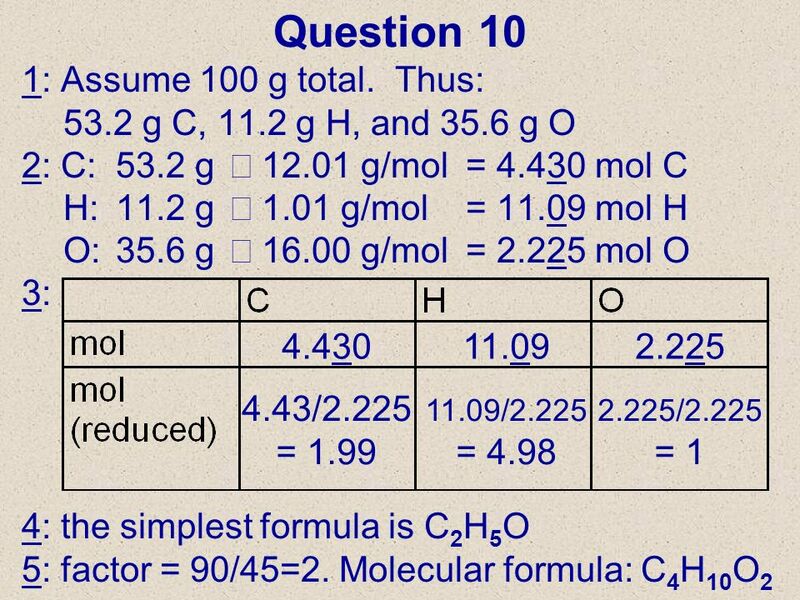 Give the molecular formula. 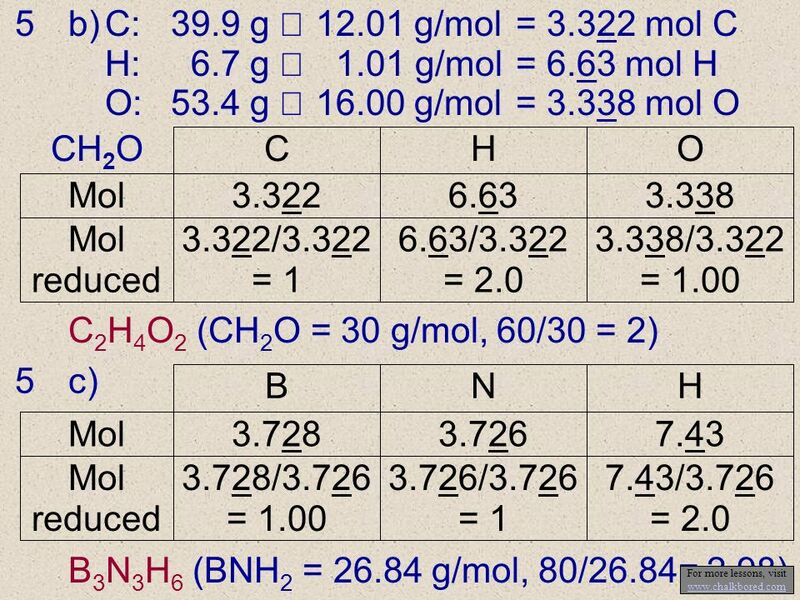 A substance is decomposed and found to consist of 53.2% C, 11.2% H, and 35.6% O by mass. 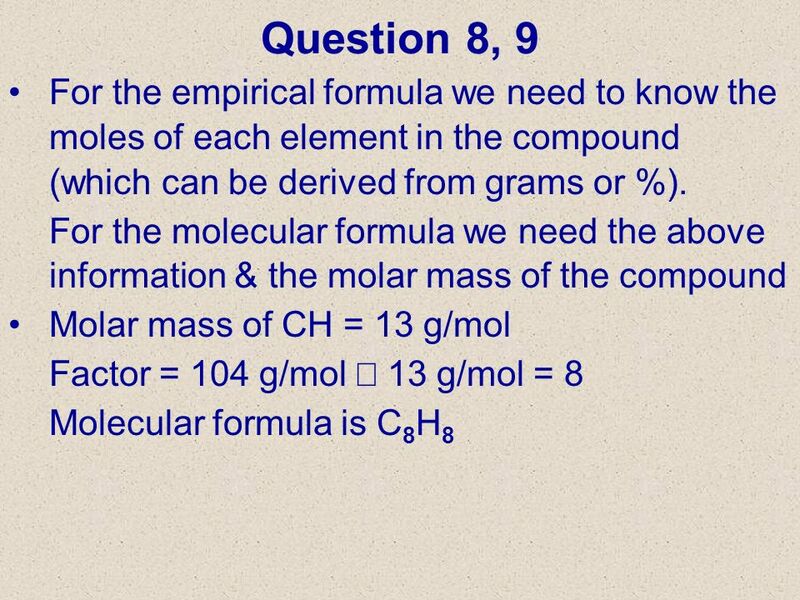 Calculate the molecular formula of the unknown if its molar mass is 90 g/mol. 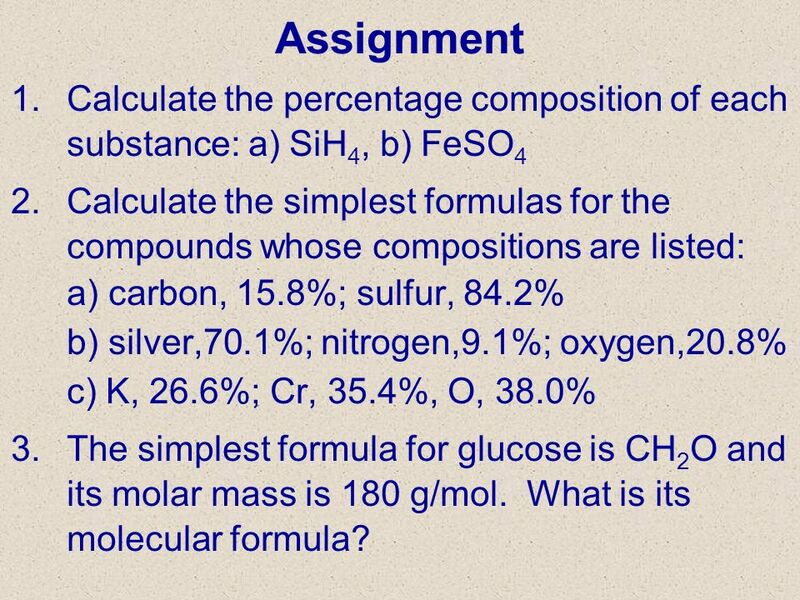 13 3/27/2017 Assignment Calculate the percentage composition of each substance: a) SiH4, b) FeSO4 Calculate the simplest formulas for the compounds whose compositions are listed: a) carbon, 15.8%; sulfur, 84.2% b) silver,70.1%; nitrogen,9.1%; oxygen,20.8% c) K, 26.6%; Cr, 35.4%, O, 38.0% The simplest formula for glucose is CH2O and its molar mass is 180 g/mol. What is its molecular formula?